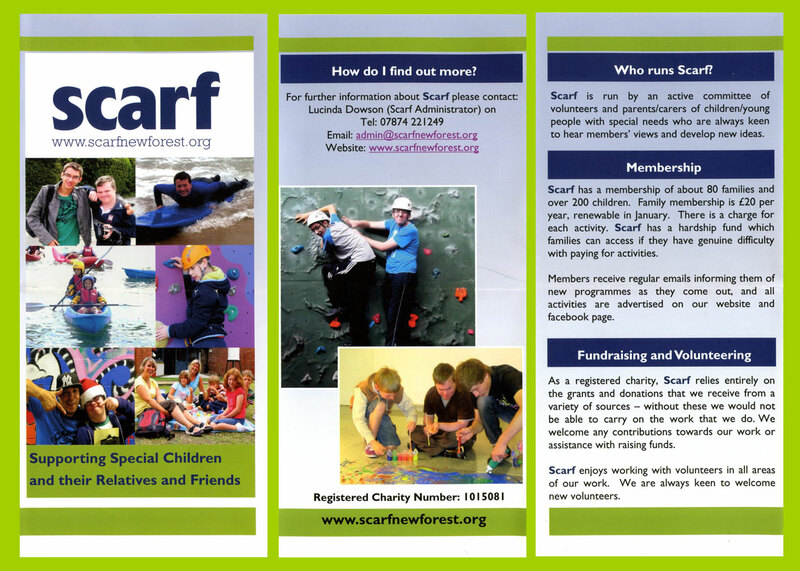 Over the years, the Scale section of the Club has supported a wide range of charities. Some of the more recent ones are listed on this page. 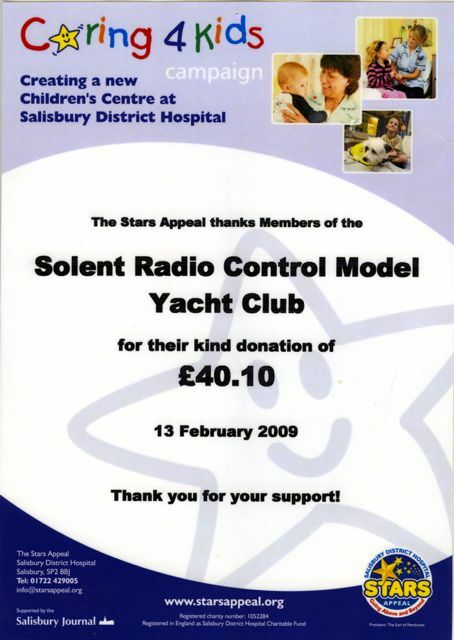 If the funds donated were the result of a Club event like one of the Model Boat Shows, where possible, a copy of the “Thank You” letter received from the charity is shown on the photo album page for that event. Other “Thank You” letters can be viewed below. In recent years the Club’s autumn charity exhibition has received valuable sponsorship from HSBC (Lymington Branch) and WightLink which we gratefully acknowledge. The Royal National Lifeboat Institution (RNLI) is the charity that provides a 24-hour lifesaving service around the UK and Republic of Ireland. It is entirely funded by public donations and receives no funding from the UK Government. Up to about 2010 the SRCMBC exhibited models at various Lifeboat days in the region, in particular Lymington and Calshot. However from 2010 onwards the Scale Section has held two Charity exhibitions each year, one in Highcliffe, and the other at Lymington and, latterly, Milford-on-Sea. The proceeds from these exhibitions have been in support of the RNLI and other charities. Available both day and night, 365 days a year, the Hampshire and Isle of Wight Air Ambulance critical care team is called out many times a day to attend to road traffic collisions, sporting accidents, collapses and many other incidents. Highly skilled crews of Doctors, Paramedics and Pilots can be at the scene of an incident within minutes, ready to deliver the same level of care that you would expect from a hospital emergency department. This charity has received a share of proceeds from the autumn Charity Exhibition. New Forest Disability provides free, impartial, confidential information and advice to those of any age affected by disability. Related issues include: caring, access, blue badge, welfare benefit applications, volunteering opportunities, equipment, holidays, training, education and transport etc …. 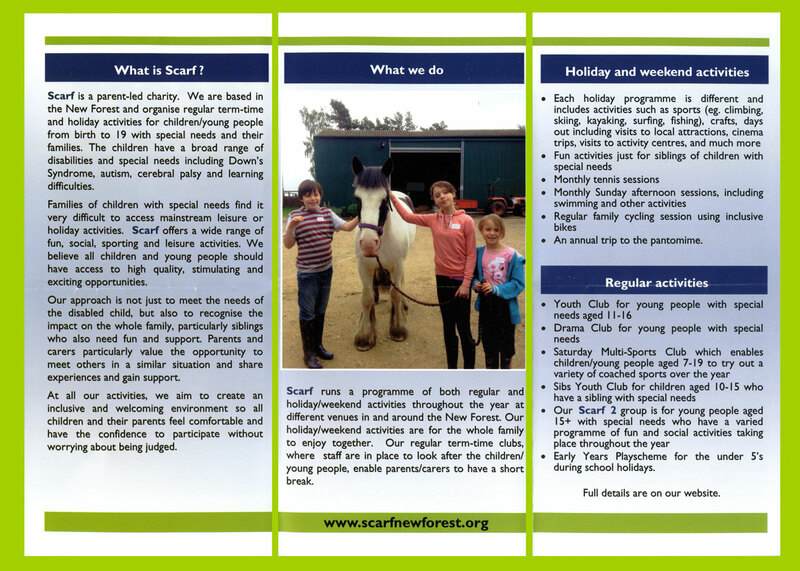 throughout the New Forest and surrounding area. 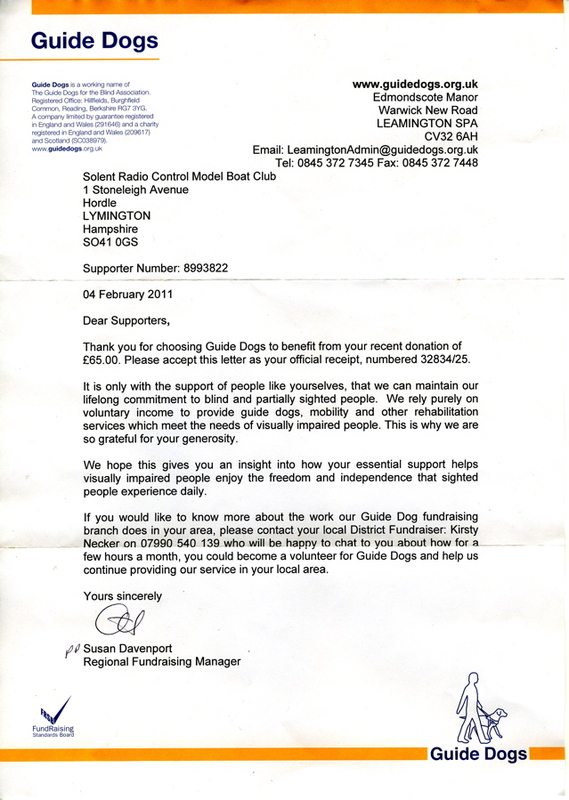 It has received donations from money raised at Christmas lunches. National Coastwatch Institution (NCI): “Eyes along the Coast”. NCI is an entirely voluntary organisation which contribute to marine safety by keeping a visual watch along UK shores. The Club has donated to the NCI Calshot Tower Lookout Station which is situated on Calshot Spit where Southampton Water meets the Solent, one of the busiest coastal sea locations in the UK. Help for Heroes: “The message is simple: H4H does not seek to criticise or be political, we simply want to help and to do so by asking everyone to do their bit to raise money. Once that money is raised, we go to the experts in the Army, Royal Navy and Royal Air Force for guidance as to how best to spend it”. 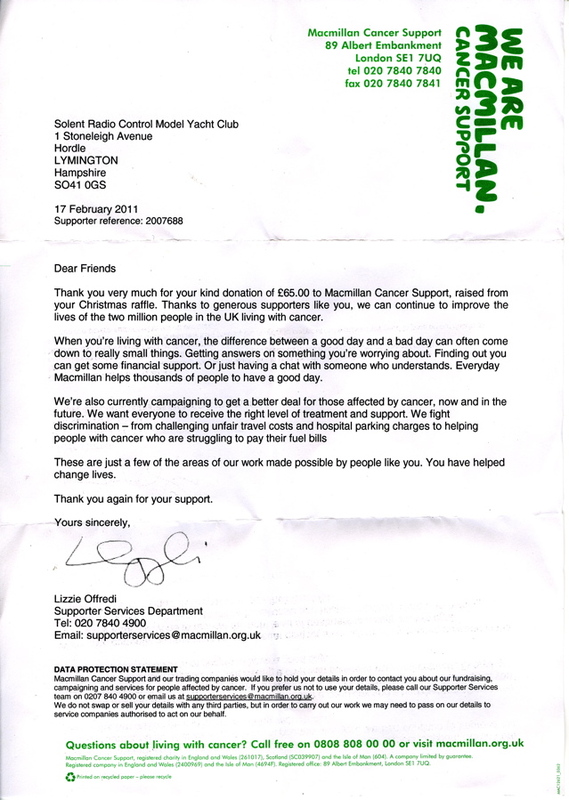 The Club made donations from the 2009 Christmas Lunch [Thank You letter] as well as the Lymington Charity shows (see events albums). Macmillan Cancer Support improves the lives of people affected by cancer. There have been individual contributions in memory of past club members and Club donations raised by the Christmas Lunch raffle [Thank You letter (2009)] [Thank You letter (2010)]. Naomi House is the children’s hospice for Berkshire, Dorset, Hampshire, the Isle of Wight, Wiltshire and the fringes of West Sussex and Surrey. They help over 220 families with life limiting conditions and support their families. They are there for the good days, difficult days and last days. 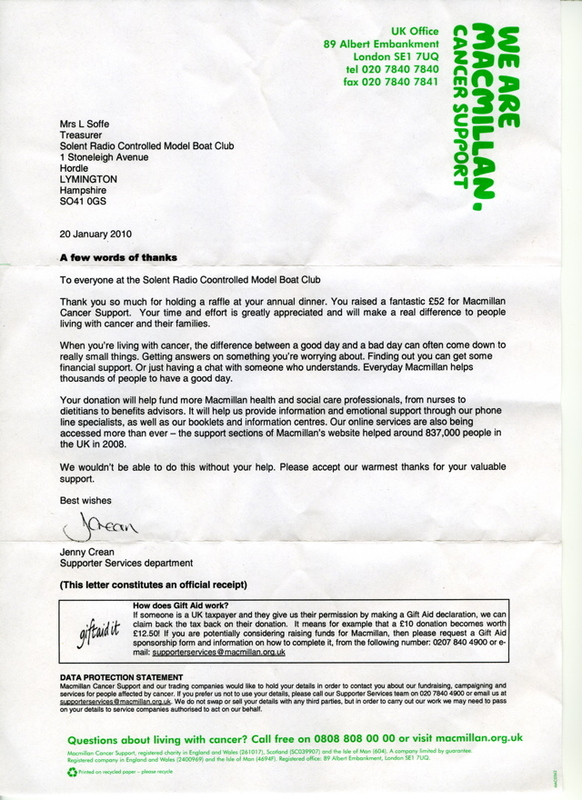 The SRCMBC has donated funds raised by the Christmas Lunch raffle as well as donations by Club members. [Thank You letter]. The Stars Appeal raises money to create the best possible experience for the 300,000 people who rely on Salisbury District Hospital. It funds extra care and equipment over and above that provided by the NHS. 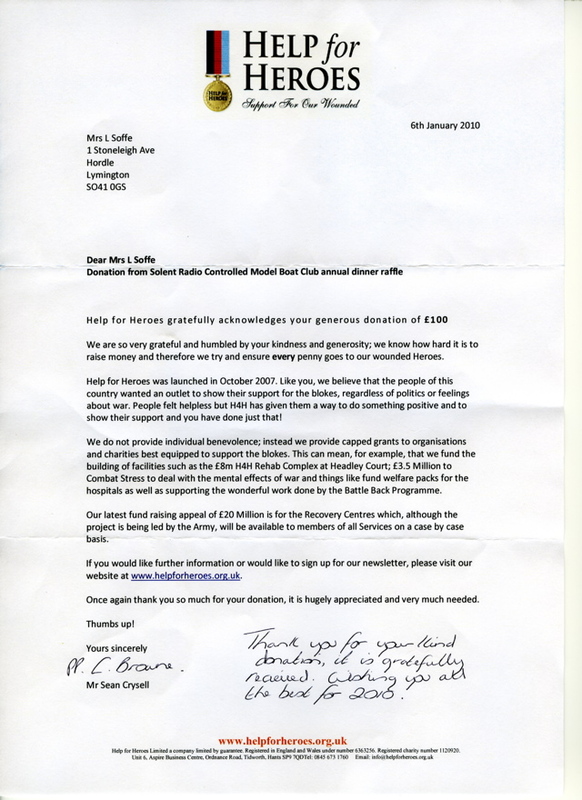 Proceeds from the SRCMBC 2008 Christmas lunch raffle were split between Naomi House and The Stars Appeal [Thank You Letter]. Oakhaven Hospice Trust provides specialist palliative care and support to those facing life-limiting illness and their loved ones in both a home and hospice setting. 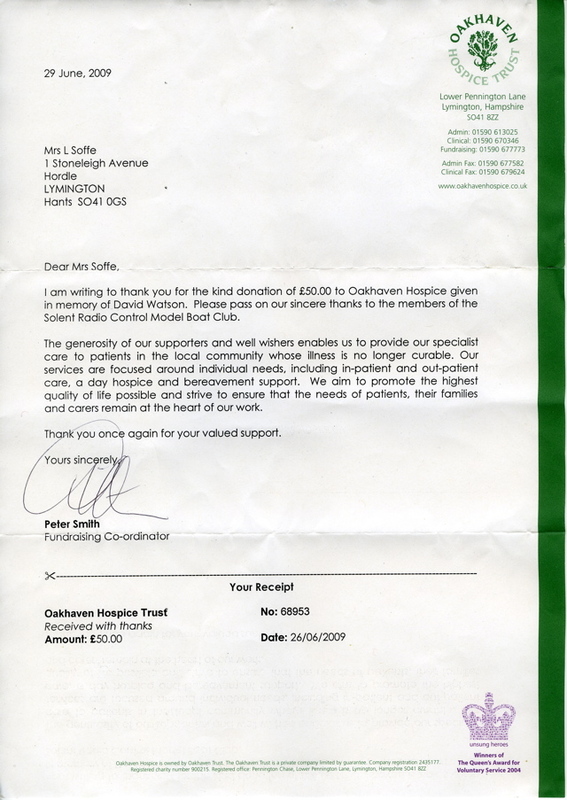 The Club has donated in memory of past members [a Thank You Letter].